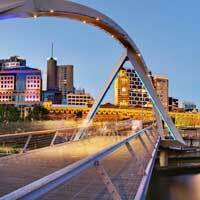 Looking for a cheap ticket to Melbourne? Here you can search all major low-cost airlines for cheap flights to Melbourne. Before you book a flight you can use Utiket to find the cheapest flights to Melbourne for Qantas (QF), Virgin Australia (VA), Emirates (EK), Air New Zealand (NZ), Singapore Airlines (SQ), Tigerair Australia (TT). All flight data are real-time and accurate. Follow the links to search and book your cheap ticket to Melbourne directly with the airline or one of our partnering travel agents. The metropolitan area of Melbourne is being served by several airports: Melbourne Airport, Melbourne Avalon Airport. You can find more information or the cheapest tickets to all these airports here on Utiket. The Melbourne Airport or also known as Tullamarine Airport is one of four airports serving the Melbourne Metropolitan area. Of these four it is the only international airport and it is also the second busiest airport in Australia. Melbourne Airport is well connected to outside destinations in Asia, Europe and America as well to over 30 domestic destinations. Read more about Melbourne Airport. From passenger data Avalon Airport is the second busiest airport of the four airports serving Melbourne. Avalon Airport is located in Victoria, Australia, fifty kilometers or thirty-one mile to the southwest of downtown Melbourne and fifteen kilometers or nine miles northeast of the city of Geelong. Avalon Airport operated by Avalon Airport Australia which is a subsidiary of Fox Group Holdings. Avalon is currently served by only one airline passenger, Jetstar Airways, which started domestic flights in 2004. Read more about Melbourne Avalon Airport. This is a list of all airlines flying to and from Melbourne and how many flights and destinations they serve. You can see a complete list of airlines and flight options to Melbourne.